It’s getting worse. Piles everywhere. 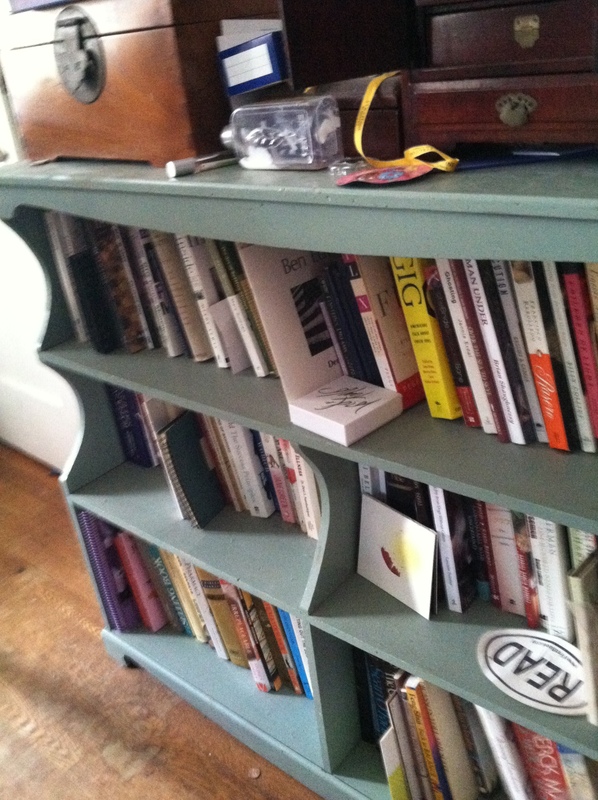 I may gaze with lust at pictures of gorgeous and clever bookshelves but in my house, books live in chaos. 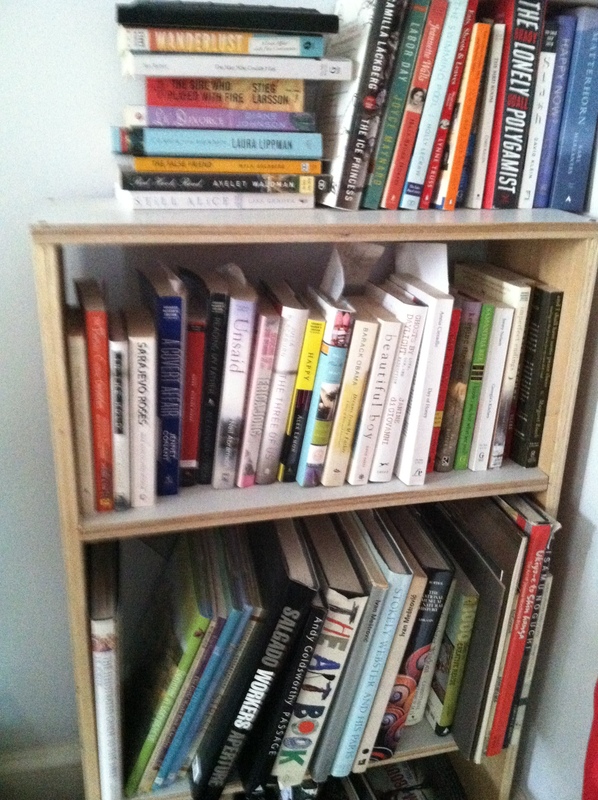 Paperbacks, hardcovers are not organized by subject, nor author, nor color (egads) or most recently acquired. Advanced Readers Copies are piled in with purchased titles. 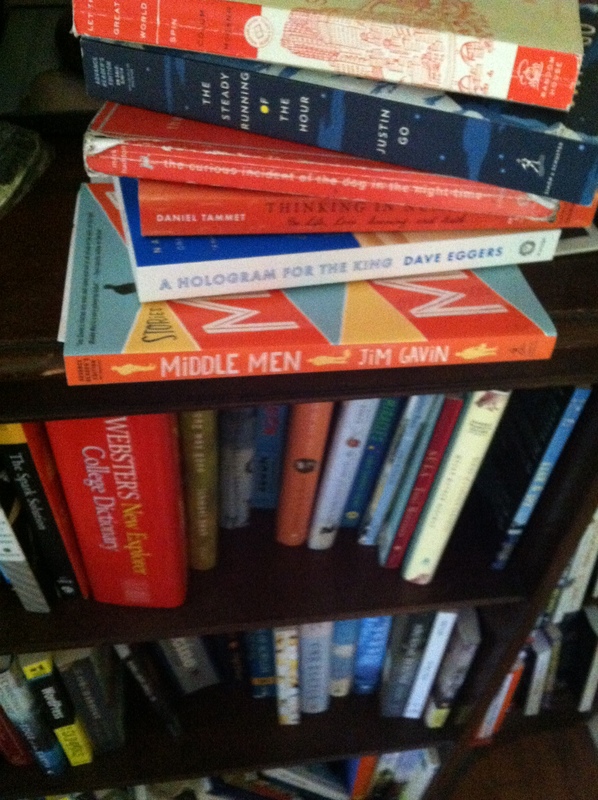 Anywhere I sit in the house there is a book within grabbing distance. Teetering on the table beside my corner of the couch (next to the reading light, of course) is a stack of mostly memoirs. Sometimes I’ll pull a title off a shelf because I forgot I owned it and have yet to read it. For that same reason, I also have multiples of the same title like Truth and Beauty that I own both in paperback and hardcover. (how have I not read this yet?) 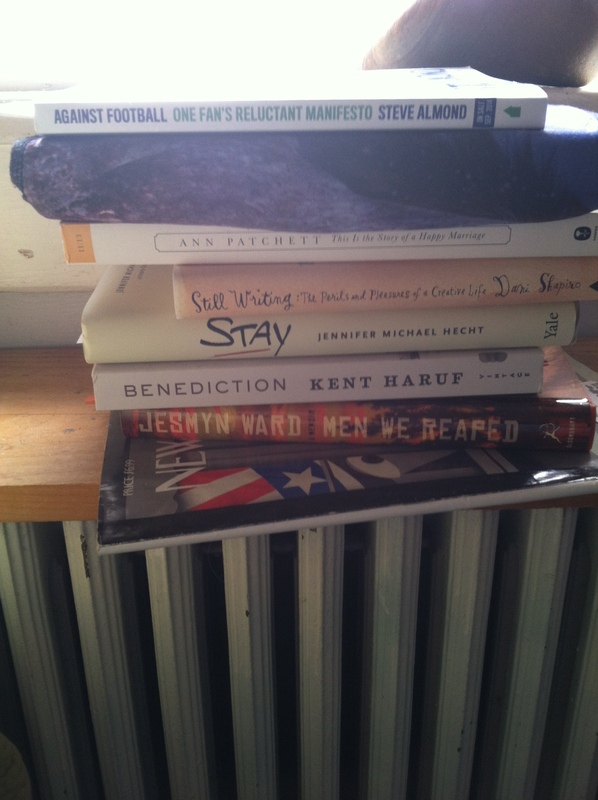 Thus grows another pile – as if by cluttering up a table with them increases the odds I’ll read them sooner. Bed-side, of course I have more books. These are what I am reading now and what I intend to read next before sleeping. My stack includes collected essays providing me with inspiration as I find my own writerly way. Currently in that camp are Ann Patchett‘s This is the Story of a Happy Marriage and Dani Shapiro‘s Still Writing – both warm and encouraging writers who reach out across the pages to say it is possible, be brave. Not even my kitchen is a book-free zone. Of course, I love cookbooks. 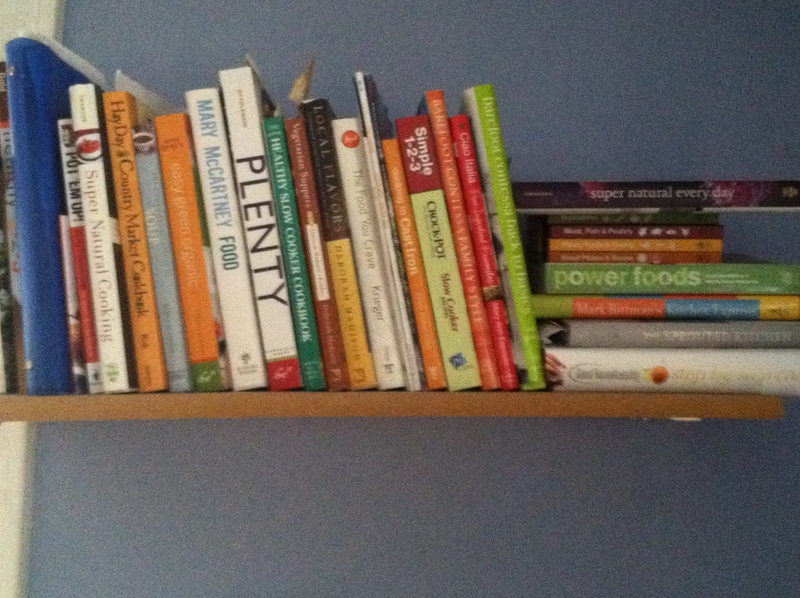 While the lesser-used ones have been relegated to a cupboard with some pots and pans, the shelf holding the tomes with my go-to recipes threatens to collapse. My favorite continues to be Super Natural Everyday by Heidi Swanson whose food blog, 101 Cookbooks I suggest you subscribe to. Even at work, where reading consists of stolen minutes while eating lunch, I keep a pile of appealing ARCs I’ve snagged under my desk. Peter Heller‘s The Painter is what’s on the menu these days, pages getting dappled with salad dressing daily. Last week’s great treat was attending a presentation of new books by Independent Publishers organized by B&N and the Association of American Publishers. It was intoxicating to listen to these publishers and bask in their obvious passion and love for the new titles they described so eloquently. How can I not love my job, this crazy business of books? As I harbor publishing hopes of my own, what an inspiring peek into the kitchen where the cooking gets done. These professionals with their smarts, passion are one of the major of a myriad of reasons I will not self-publish. I want some of that love! So yes, there were freebies. Yet, when it was time for a break and 100 plus of my fellow booksellers lined up to grab them, I went for a cup of tea. I hate lines and didn’t fancy shlepping books through the streets of Manhattan back to Connecticut. And as you can see from these photos, I have enough to read. I was very proud of my self-control. But then the last publisher took the mic. 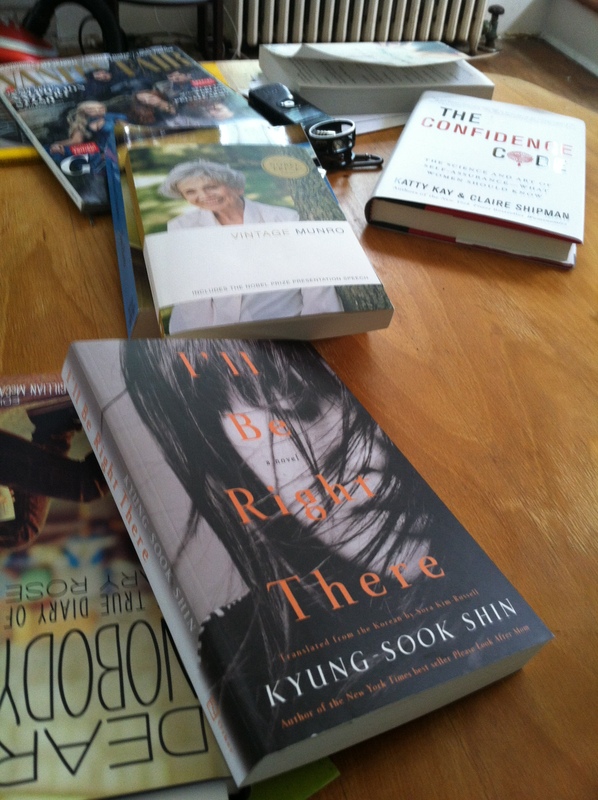 Publisher Judith Gurewich, introduced 2 new titles her press, Other Press will be releasing: I’ll Be Right There by Kyung Sook Shin who also wrote Please Look after Mom and The Goddess of Small Victories by Yannick Grannec. Her description of both of these books was so enthralling and passionate, I beat 100 booksellers out of the room and cornered Judith to tell her so. She insisted on giving me her last ARCs. I’ll be reading them. My book lust feels almost greedy, my cravings never sated. Am I being a hoarder, nervously anticipating that day when I can no longer main-line books before they’ve even hit the shelves? My question to myself and anyone else who’d care to answer, am I becoming a bit of a crazy person? Do I have a problem? The book I’m reading before I fall asleep each night is An Unnecessary Woman by Rabih Alameddine. Even more book-mad than me, Nina Sankovitch knew I’d love this book and of course, she is right. A brilliant, aging woman in Beirut lives contentedly, alone with her books. Her apartment is crammed with them. Reading this beautiful portrait of this literature lover makes me feel a little less wacko. Or at least that I’m in good company. P.S. I also own a NOOK. It’s somewhere… probably under a pile of books. This entry was posted in Uncategorized and tagged books, memoir, reading, work, writing. Bookmark the permalink. I loved this post — I was smiling with familiarity while I read it!! I too have piles all over the house and at this point, they’ve unofficially become part of the décor. 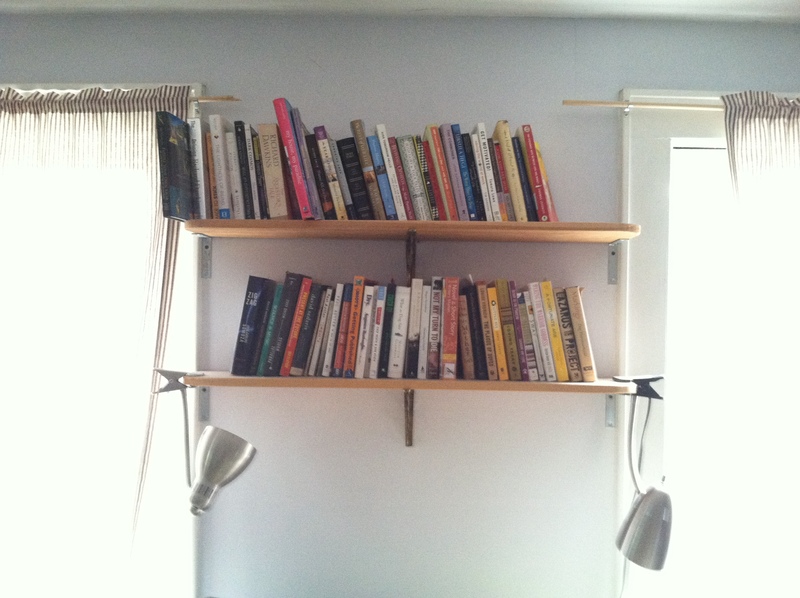 Tricia, you would feel so at home here – 18 bookcases of varying sizes and little piles here and there. I remember something Anna Quindlen wrote about hoping her children would love books and would consider bookcases as the backbone of interior decorating. Those are not the exact words, but definitely the sense. No, I don’t think you are crazy and I admire the variety of your reading. Stay with it and keep loving it! Don’t you love looking at other people’s piles? A house without books – well, I wouldn’t want to live there! Don’t worry about that, Sheila! You know it’s partially in the genes, after all! Wow, that’s an impressive collection. yes — not exactly travel-ready, am I? I loved this, loved your pictures, loved the cozy, energized feeling your pictures give me. 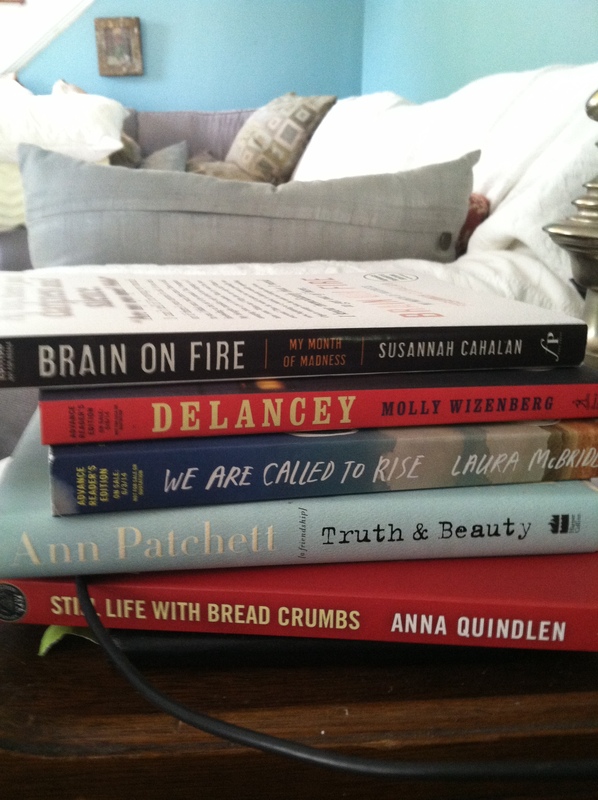 I love, love, love the two Ann Patchett books. This is the Story of a Happy Marriage was so humane and comfortable and encouraging. It was a great read before sleep. Right now I’m in a weeding my books phase. Sort of. I still have four boxes of books sitting in my garage room, that I need to give away or sell. (We have a half price books in town and I’m told they will buy books.) Weeding all of those barely made a dent. 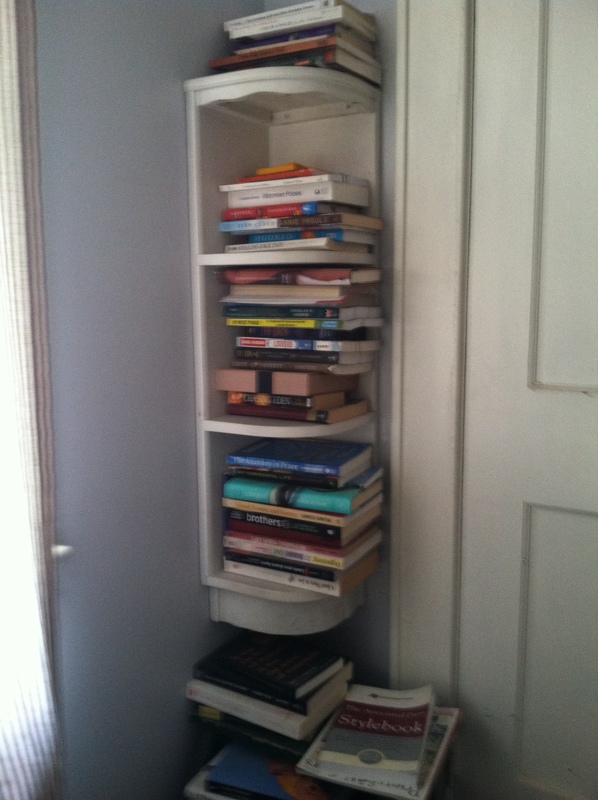 I want some more bookshelves for my notebooks of manuscripts. I have two bits of wall space I am eyeing. Once in awhile I nudge Bruce to make them, but he just shrugs his shoulders, saying I have enough…Ugh. I also like how your books are spread all over the house. Mine are too. My favorite place to work is the living room, so the table in here is piled high. One of my projects is to organize and clean it, and put a few notebooks together, but it seems Facebook takes priority!